Written by: Jessica Greenlee on August 20, 2012. Summertime, and the roses are blooming. It’s great to gather them in bouquets and admire them in gardens, but there are other, craftier things you can do with them. For example, you can make rose beads. There are several methods of making them, so I did what any geek would do: I read a lot of different directions, tried a few different things, and came up with my own method, one which seems quite practical and relatively trouble free. Here it is! 1) Plant lots of roses. Grow them without systemic pesticide (Do you want to give your friends poison-laced necklaces? I thought not). Alternatively, you can beg petals off of environmentally minded friends or relations, but that isn’t nearly as much fun. You can also ask total strangers, but they tend to give you funny looks when you start inquiring about the amount of poison they use in their yards. 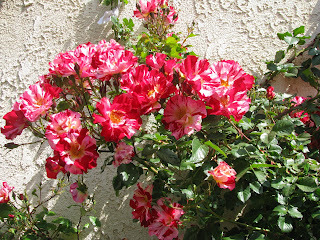 2) Gather roses off of the bushes and from vases around the house. You do have some in the house, right? If not–why not? Gather lots of roses, at least a large mixing bowl full, but be sure to leave some roses for the bees (they’ve had a rough few years). I’m told the best time to gather the roses is in the morning when they are at their most scented; I haven’t done a comparison, but in my opinion, the best time to do something is when you’re ready. 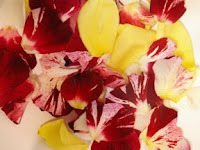 3) Pick the petals off the roses so you can grind them. You want the petals, not the center stuff. Ideally, you’ll cut the tough little tips where the petal joined the flower off as well. 4) Place the rose petals and some water in a high-quality blender. You can also use a food processor, which takes more time but a little less water. In both cases, make sure you keep a close eye and ear on things: Rose petals take a lot of grinding and it can be hard on the motor. You may need to let it rest between pulses. The traditional method, incidentally, is the mortar and pestle. That’s quieter, but it takes a whole lot more time, so I won’t be describing that. You’re looking for something that, when strained, will make a kind of clay, so the mix needs to be very finely ground. Generally, this takes several steps: Start grinding one day, store them in a jar in the fridge for a night or two, then grind again until it reaches the consistency you want. 5) Take a break. After you have ground the roses, use some of the rose water to make something tasty. Rose cookies are good–you can follow an official recipe or you can make sugar cookies and substitute rose water for the vanilla and some of the liquid. 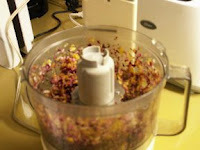 I like to leave a bit of the ground rose petals in the blender, add some rose water, and make a smoothie. Chocolate and roses are a perfect pair, but I should imagine citrus and rose would work as well. Sit out in the shade, preferably under a tree with rustling leaves, with the smoothie and a good book and enjoy a few minutes of peace. a) You can heat them on the stove; keep them at a very, very low temperature so that they don’t boil. Apparently, the Victorians did this for days. Stir the mix occasionally with a wooden spoon. 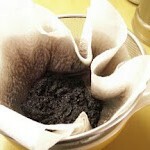 c) Refrigerate the rose clay for a while and then go straight to straining it. I usually use the third method which has the added benefit of letting me add more petals as time passes rather than having to have quite all the roses ready at once. a)For reddish beads: Use only red rose petals. Either don’t cook them at all or cook them in a non-reactive pan. b) For light yellow to yellow-brown beads: Use only white and yellow petals. Either don’t cook them at all or cook them in a non-reactive pan. 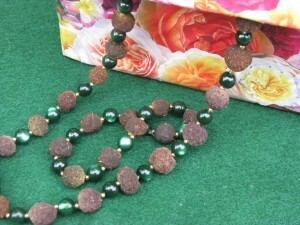 c) For darker brown beads, mix all your colors together. If you want a matched set, you’ll have to use all beads from one batch. d) For black beads: The color of the rose doesn’t matter. What does matter is that you cook them on low with iron (rusty iron nails will do the job), or better yet, in an iron pan. Rust is good, in this case. Don’t expect dramatic color, not without artificial help, at any rate, but you do get variation that can be quite pleasant when you string them. 8) Drain the clay. 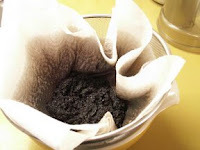 I usually line a strainer with several layers of paper towels, let it sit for a while, and then very gently squeeze out the extra water. Cheesecloth would probably come in handy here, but I never have any around. 9) Shape the beads. Pinch off a bit and roll it into a large, marble-sized ball. It needs to be three to four times the size you want your final bead to be. 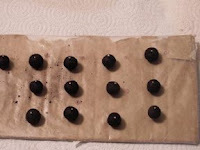 10) Cover a piece of cardboard with wax paper; pin the beads to the paper. 11) Leave them somewhere to dry. If you live somewhere humid, it’s important to get them out into the sun, and/or keep a fan set to low trained on them. 12) Periodically (every day or so) give the beads a gentle twist so they don’t dry too tightly to the pins. 13) Once they’re dry, they’ll be nice and hard and ready for making into jewelry. They’ll keep some of their smell, too. Rumor has it that the smell lasts for centuries, but I have no way of testing that, and it may be that one has to use the Victorian slow method to get the sort of bead that will last that long. 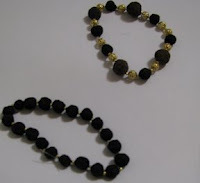 Of course, you can always mix them with other beads as well. If you try this, be sure to drop us a line and let us know how it went, either here in the Comments section or on our Facebook Page. We’d love to see what you made. Interesting article! I’d never heard of rose beads. Did you first hear of them in a Victorian novel? I remain unable to see anything from you or anybody else except when I receive notifications from Facebook. I think I first read about them online when I was trying to figure out what sorts of things could be made with rose petals. The beads sounded like great fun, and they were apparently very, very popular in the Victorian era. There’s some thought that they’re even earlier than that, that term rosary came from the fact that rosary beads were made of rose petals, but I haven’t researched enough to figure out how accurate that might or might not be. Loved your article! Thank you for sharing! I could not get my phone to work correctly when I tried to “share”. Will you please email it to me? Sent! Hope that works for you. My grandma just recently passed away and there were several roses in arrangements that were sent, thought this would be neat to do. My cousin had a bracelet that she had made with rose petals and I did my own search. 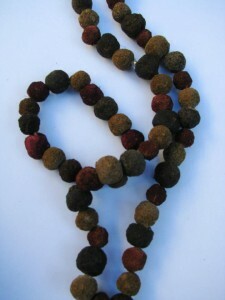 Curious if you’ve ever used dried petals or using some sort of clear coat on the beads?? My grandma also saved all the petals from her mother’s day corsages – thought it would be nice to do something with those. Hi, sorry about the delay on the response. My suggestion would be to soak the petals to rehydrate them before working with them. If you want to boost the scent in them, you could use a few drops of essential oil while mixing. As to clear coating, you could use a bit of spray varnish or Modge Podge. You can buy Modge Podge at a craft store or you can make it yourself by thinning down craft or Elmer’s glue: half glue, half water. I would suggest you let it dry thoroughly before Modge Podging though. Also, use very thin coats. It may take more than one, but be patient with letting it dry between them. My dried rose beads are bumpy an ugly. Is there a way to smooth them or coat them or start over to get them more smooth?